Marathon morning sessions driving you mad? Relax….here comes a recipe to your rescue! Can be prepared in advance and stored for long. Gives you comfort and generously offers company to idlis, dosas, bread, hot steamed rice when they long for one. Combine it with plain yogurt and serve with crispy South Indian snacks as a dip! Just a minute….don’t miss reading a tip or two that we share at the tail end of this recipe. Wash curry leaves in salt water and dry them thoroughly (keeping it indoors) before roasting them. Make sure your hands, all ingredients, plates, spoons, kadai, container for storing etc. are all absolutely dry all through the process right from preparation till storage of the powder. Grate dry coconut and keep it aside. Measure and keep all ingredients required for roasting, ready in different plates. Now you are ready to start roasting…. Roast all the above ingredients separately (in the same order listed under ingredients) over low flame in a pan. After each ingredient is roasted keep transferring to respective plates. Let them cool thoroughly at room temparature. Dry coconut can be roasted last. When you are done with roasting all other ingredients, turn off the flame. Heat that remains in the pan after switching off the flame is enough to roast dry coconut. 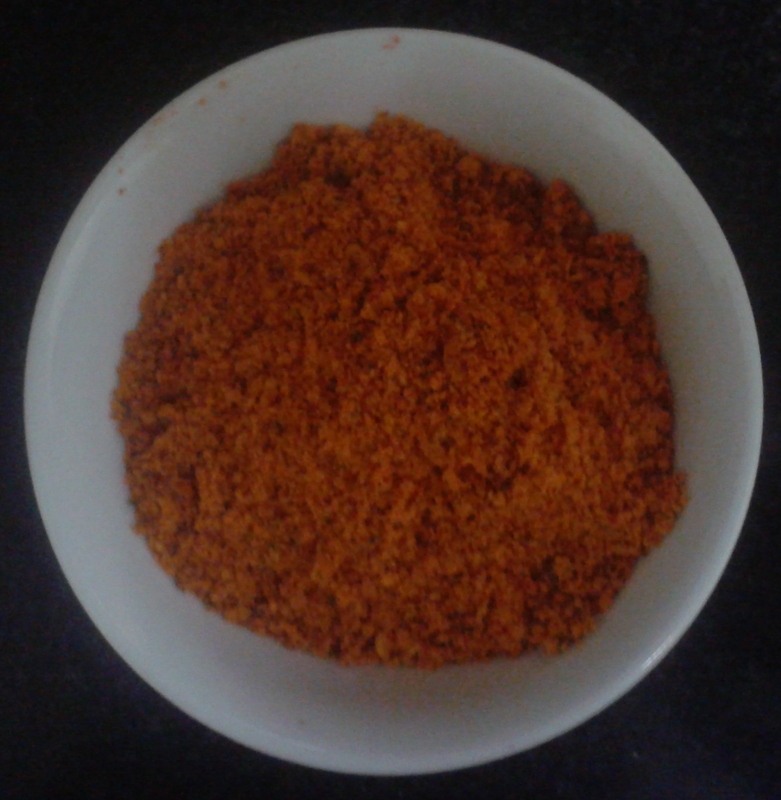 Grind the ingredients in a mixie in the following order: Dry chillies, bengal gram, black gram, groundnuts, tamarind, salt, curry leaves, roasted gram, dry coconut, asafoetida, jaggery. Powder them neither too coarse nor too fine. Store it in an absolutely dry air tight container. While preparing any masala powder, it is always advisable to dry fry ingredients separately due to variance in size, thickness and texture of ingredients. The time and temperature required for each ingredient also varies. Roast byadegi (or Kashmiri) variety of red chillies for approx. 2 to 3 min. These chillies don’t change colour easily. Hence, as soon as you smell the roasted flavour of chillies, remove them from the pan. Roasting Guntur variety of red chillies takes even lesser time as they are not wrinkled like the former. However, the exact time for roasting depends on the amount and type of heat (depends on gas burner, electric stove or microwave). Best method to judge the roasting time for chillies is by sensing the smell.